Bulk Image Downloader - инструмент для полной автоматизации загрузки изображений из интернета. Он дает возможность быстро загружать галереи изображений, не надоедая пользователю рекламой и всплывающими окнами и не заставляя постоянно щёлкать мышкой по понравившемуся эскизу изображения. Программа работает со многими популярными фотосервисами, в том числе с Photobucket, Imagecash, Imageshack, Megaupload и со многими другими (более 20). Кроме этого, поддерживается загрузка и с обычных HTML-страниц, в коде которых Bulk Image Downloader может находить ссылки на изображения автоматически. Программа интегрируется с популярными браузерами IE, Firefox и Opera и вызывается из контекстного меню. Bulk Image Downloader is a specialized tool designed to automatically download and save images from thumbnailed image galleries, bypassing all annoying popups and adverts. It can also extract image information from regular text files (such as saved html pages or plain text files containing links) and web pages where image links are listed as plain text. 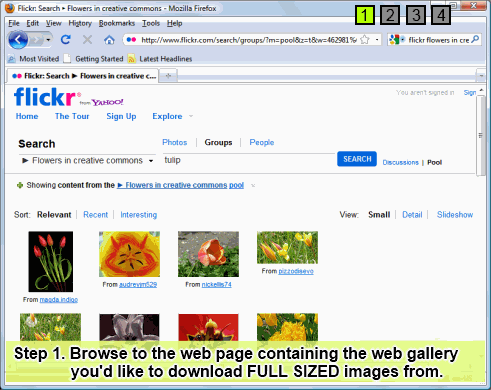 Almost all popular image hosting sites are supported and the built in image locator AI can locate the full sized image in most web pages no matter what the layout. It integrates with Internet Explorer, Firefox and Opera via the right click context menu for even easier downloading. Image Host Support - BID works with almost all popular image hosting sites, such as flickr, imagevenue, imagefap, imageshack, imagebam, etc. Full Sized Images - BID uses an advanced heuristic scoring method to locate full sized images. This means BID can work on most galleries automatically, with no user configuration necessary. Batch Downloading - Automatically download from huge lists of gallery URLs via the integrated Queue Manager. Web Browser Integration - BID integrates with IE, Opera, FireFox and Chrome. Just right click inside your browser window and select "Open current page with BID"
Multi Page Gallery Downloads - BID can detect and download from most popular multi page web galleries out of the box. Password Protected Websites - BID will prompt for user names and passwords if the web site requires them. Image Validation - BID checks every image to make sure it's been downloaded correctly. Invalid images are retried automatically. Resume Downloads - BID will resume downloads from the point at which the connection was broken. Multi Threaded Downloading - BID can download up to 50 images at once. Download those galleries quickly! Redirection Resolution -Some sites use image redirection "services" like imagecash, urlcash etc. to display adverts before redirecting to the imagehost. BID automatically resolves these types of links. File name unmangling - BID will retrieve the correct file name from image hosts that scramble filenames (where possible), such as imagevenue, imagefap. Export Galleries to HTML or BB Code - Quickly generate gallery code suitable for pasting into web forums. This function will now display the flickr authorisation URL required to link BID to your account. If the authorisation page fails to load within the BID window, please copy and paste the authorisation URL into your default browser to continue. Follow the prompts until a "validation code" is displayed. Enter this validation code into BID to continue.